Data Brewery home page was redesigned. I would like to thank Andrej Sykora who did a great job with the new look and migration of the old blog posts. The main reason for redesign was providing more content for each project. Another one was to have it designed in a way that future projects can be easily added – by having one subdomain for each project. The Data Brewery blog is moving away from Tumblr. New blog posts will be generated using Pelican to static pages. The base URL will stay the same: blog.databrewery.org. The old blog URLs are being redirected to the new URLs. There are still few blog posts that need to be migrated, but we hope to have these finished soon. If you are following the blog with a feeds reader, here is a link to the new feed. After few months and gloomy winter nights, here is a humble update of the Cubes light weight analytical framework. No major feature additions nor changes this time, except some usability tweaks and fixes. Documentation was updated to contain relational database patterns for SQL backend. See the schemas, models and illustrations in the official documentation. Also improvements in cross-referencing various documentation parts through see-also for having relevant information at-hand. added order_attribute to Level object - specifies attribute to be used for ordering according to order. If not specified, then first attribute is going to be used. Sources can be found on github. Read the documentation. Join the Google Group for discussion, problem solving and announcements. If you have any questions, comments, requests, do not hesitate to ask. AggregationResult.levels is a new dictionary containing levels that the result was drilled down to. Keys are dimension names, values are levels. AggregationResult.table_rows() output has a new variable is_base to denote whether the row is base or not in regard to table_rows dimension. aggregation browser subclasses should now fill result's levels variable with coalesced_drilldown() output for requested drill-down levels. Moved coalesce_drilldown() from star browser to cubes.browser module to be reusable by other browsers. Method might be renamed in the future. After a while, here is an update to Cubes - Python Lightweight OLAP framework for multidimensional modeling. There are some changes included that were mentioned in the EruoPython talk such as table_rows and cross_table. I recommend to look at updated examples in the Github repository. The Flask example is now "real" example instead of "sandbox" example and you can see how to generate a simple table for dimension hierarchy browsing. There is also a more complex example with star-like schema dataset in the cubes-examples github repository. Follow the instructions in README files how to make it running. There are some backward incompatible changes in this release – until 1.0 the "point" releases will contain this kind of changes, as it is still evolving. You can find more information below. added table_rows() and cross_table() to aggregation result for more convenient table creation. The table_rows takes care of providing appropriate dimension key and label for browsed level. Incompatibilities: use create_model() instead of Model(**dict), if you were using just load_model(), you are fine. To address issue #8 create_model(dict) was added as replacement for Model(**dict). Model() from now on will expect correctly constructed model objects. create_model() will be able to handle various simplifications and defaults during the construction process. AggregationResult.table_rows() - new method that iterates through drill-down rows and returns a tuple with key, label, path, and rest of the fields. What is the data type of 10? Depends on who you are, what are you going to do with it. I would expect my software friends to say that it is an "integer". Why this information might not be sufficient or not relevant? How analysts see the data? If we say "data type", engineers would name types they know from typed programming languages: small integer, double precision float, character. This data type comes from how the data are stored in memory. The type specifies what operations can be done with the data stored at that particuliar place and how much memory is taken. To add two integers on an Intel processor there is an instruction called ADD, to add two floats there is a different instruction called FADD (Dear kids: this used to be on a separate chip in PCs!). To add an integer with an float, there has to be a conversion done. Database people would say decimal, date or string. Same as with memory data types, each type has it's allowed set of operations and size it takes in the database. They both are of one kinds of data types: storage data types. Storage data type, as the name suggests, is used by software (compiler, database system) to know how much memory it takes to store the value of that type and to select appropriate operations (or operation variants). Do I need all taht information about data type when working with data? In most cases I don't, it is information for machine, not for me as data analyst/scientist. There are cases when knowing about data types might be handy, like optimisation (for memory consumption for example) or error prevention (of some kind) by type checking in typed languages. For simplification, some tools use generic data types and hide the concrete storage type: integer, float (or real), string, ... No storage size, no byte order. Those are low level details. For reading the data, no input from user is required, as short int is integer and double is real. Problem with generic data types is that there might be multiple options how to store a generic integer. When doing data analysis I think about variable values and what I can do with them. In data analysis adding two integers or two floats is the same. It is just a + b. There is only one kind of addition: + (remember the ADD and FADD?). However, there might be numbers that adding them together will have no meaning, like adding two invoice numbers or years together. Values represent categories, like colors or contract. types. Fields of this type might be numbers which represent for example group numbers, but have no mathematical interpretation. For example addition of years 1989 and 2012 has no meaning. Similar to set field type, but values can be ordered in a meaningful order. Special case of set type where values can be one of two types, such as 1 or 0, ‘yes’ or ‘no’, ‘true’ or ‘false’. Set of integers - values can be ordered and one can perform arithmetic operations on them, such as: 1 apple + 2 apples = 3 apples. The analytical data types are disstinct from storage data types. Take for example just an integer: it can be from a set without any arithmetic operations (ID, year), can be a discrete number (count of something), a flag with binary values of 40 and 50. Integer as a set can be ordered as set of product sizes or unordered as kind of IDs or category numbers where categories are ordered by their names rather. In addition to the mentioned data types, it is sometimes useful to specify that the tool or algorithm should just ignore a field/column/variable. For that purpose typeless analytical data type might be used. The idea behind analytical data types is described for example in nice introductory data mining book  or also in . differentiates measures as interval-scaled variables and ratio-scaled variables. Interesting that  describes the "set", which they call "categorical variable" as "generalization of the binary in that it can take one more than two states", not the other way around. Max Bramer: Principles of Datamining, Springer Verlag London United 2007, p12. Jaiwen Wan and Micheline Kamber: Data Mining - concepts and techniques, Elsevier 2006, p392. As data are passed through algorithms, blocks of processing code, data types (along with other relevant metadata) should be passed with them. 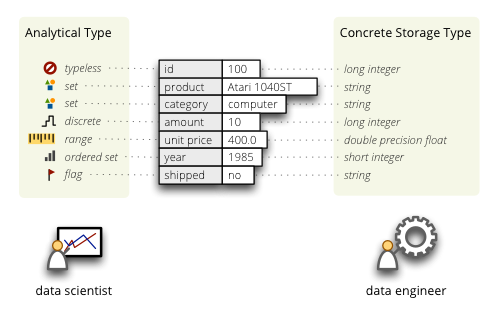 Data types can be in some cases guessed from data stream or explicitly expressed by a user, sometimes they can be reflected (like in a database). It is good to keep them, even if sometimes it is not possible to maintain accuracy or compatibility of data types between data sources and targets. If done right, even after couple of transformations, one can say to an analytical metadata accepting function/algorithm: "get averages of this dataset" and it will understand it as "get averages of amounts in this dataset". The minimal metadata structure for a dataset relevant to both: analysts who use data and engineers who prepare data would therefore be a list of tuples: (name, storage type, analytical type). Typeless programming languages allow programmers to focus on structuring the data and remove the necessity of fiddling with physical storage implementation. Hiding concrete storage types from data analysts allows them to focus on properties of their data relevant to analysis. Less burden on mind definitely helps our thinking process. Data Brewery documentation of metadata structures.